The Tweenies are a popular staple in my household and my daughter loves their antics as they play, dance and sing for the entertainment of children. So it came as quite a surprise when the DVD failed to really hold her attention for very long despite the fact that she knew the songs and actions. I have two children and at the time of writing, my eldest, Ella is 19 months old and my youngest, Chloe is 3 months old. My initial viewer was Ella. The only thing I can put it down to was that there is no let up on this disc, just song after song after song. As a result, she soon left viewing and went to do her own thing, returning when she heard a song she particularly liked. So for the most part I was left to view the disc myself. Not a hard job as it's a great distraction for kids and the Tweenies are bright and colourful even when standing still. To combat any possibilities of my daughter's age playing factor in the review we grabbed a friend's son aged about 2 1/2 and I'm pleased to say that he loved it and stayed riveted throughout the whole viewing, taking part in the dances and jumping about in front of the television. The DVD presents good value for money with 2 titles on the single disc and guarantees that you are going to get a bit of breathing room on a hectic day by placing this DVD in your machine. The songs are cheerful, though not of any real educational value, however children's entertainment can sometime's just be about having fun as well. 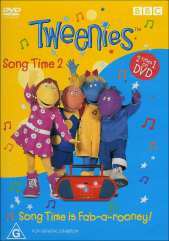 If your child loves singing and dancing then the Tweenies: Song Time 2 & Song Time is Fab-a-rooney will knock their socks off and probably save your sanity at the same time.